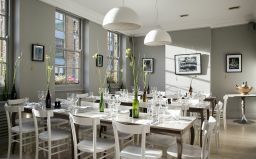 This August, Anna Hansen’s much-loved Clerkenwell institution, The Modern Pantry, will be celebrating its 10th birthday. There will be a series of events to mark the milestone, including limited edition dishes created by friends of The Modern Pantry, an anniversary afternoon tea and a brand-new range of products which will be available from their online store as well as their shop in St John’s Square. Over the years, Anna has worked with many inspiring chefs. To celebrate the 10 years, Anna has invited these friends to collaborate on special dishes, which will be available throughout August, on the a la carte menu. Chefs will include Shaun Searley of The Quality Chop House, Chantelle Nicholson of Tredwell’s, Ravinder Bhogal of Jikoni, Gianni Vatteroni previously of Dehesa, drinks experts Alex Kammerling and Diego Baud, and celebrated pastry chef Claire Clark. The Modern Pantry is well-known for its afternoon tea and Anna has created a very special limited edition menu including some classic bites as well as a few new surprises: tea smoked salmon, avocado & yuzu mayonnaise club sandwich; Cheddar, caramelised onion & sumac scone, whipped black garlic & umeboshi butter and Earl Grey pannacotta, tamarillo jelly, garam masala shortbread. The tea will be available for £23.50 or £40 with Laurent Perrier Rose Champagne and The Modern Pantry will be donating £1 of every afternoon tea sold to the charity #BakeForSyria.